Jordaens, Jacob, 1593-1678. 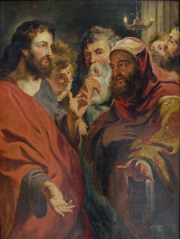 Christ Instructing Nicodemus, from Art in the Christian Tradition, a project of the Vanderbilt Divinity Library, Nashville, TN. http://diglib.library.vanderbilt.edu/act-imagelink.pl?RC=55053 [retrieved April 20, 2019]. Original source: http://www.flickr.com/photos/oxfordshire_church_photos/6218045171/.